The world is full of dangerous critters, and we’re lucky not to run into the grand majority of them during our daily lives. Animals that present a threat to humans usually live in habitats that are in the wilderness or the deep ocean, where population densities of people are low and encounters infrequent. You might consider the Great White Shark to be the most dangerous animal in the world, but you’d be wrong. It’s not the black mamba snake of Africa, nor the cone snail of tropical waters; Indeed, in terms of the sheer number of human deaths, a creature much smaller is involved: The lowly mosquito, which puts Jaws and all the classic creatures from our nightmares to shame. Mosquitoes, especially those in the Anopheles, Aedes, and Culex families, are responsible for more deaths than any other animal (humans excluded). According to the World Health Organization, mosquito bites are the cause of one million deaths every year. 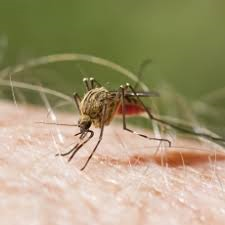 But a mosquito bite is a direct way of getting a disease indirectly; the mosquito itself isn’t the cause, it’s a “vector”, a way-station for a microbe on its way to its eventual host. These organisms are rarely, if ever, fatal to the mosquito they live in, but can be to their eventual host: Warm-blooded animals that the mosquito bites, like humans. The majority of deaths from infectious diseases transmitted by mosquitoes are caused by a disease known as malaria. It was originally thought that the disease came from foul marsh air, thus came to be known as “mal aria” or “bad air”. The World Health Organization believes that 300-500 million cases of malaria occur every year, with 1 million deaths. 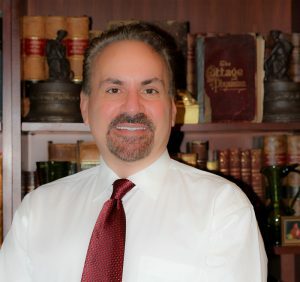 1700 cases are reported to the Centers for Disease Control and Prevention (CDC) annually in the United States, mostly by those traveling outside the country. Malaria is caused by one of four species of microbe called “plasmodium“, of which p. falciparum seems to be the worst. Plasmodium lives in the gut of mosquitoes. When female mosquitos (only females bite humans) of the anopheles species inject these micro-organisms into a human body, they colonize organs such as the liver. Once there, they travel through your circulation to damage blood cells and other organs. 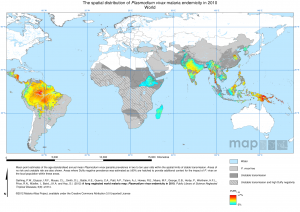 Looking at the map of the current range of anopheles mosquitoes, you would think the United States is immune to issues relating to malaria. This is primarily due to the common availability of air conditioning systems, drained swamp areas, and improved health care in modern times. Malaria was thought, however, to be a significant problem, especially in the South, in the 18th and 19th centuries; even today, a remote homestead or a community off the grid due to a major disaster might still be vulnerable to an outbreak. It should be noted that, besides anopheles, other species of mosquitoes carry micro-organisms that invade and cause damage to organs. One instance that created a sensation recently was the aedes mosquito that transmitted Zika virus to the brains of fetuses in Brazil in a 2015-16 epidemic. Some develop jaundice, a yellowing of the skin and eyes due to liver damage. Although most people begin to experience symptoms 10 days to 4 weeks after infected, it is possible to be without symptoms for up to 1 year after you are infected. Bouts of severe symptoms every two or three days is common. Some types of malaria can lead to repeat bouts of sickness. The parasites can go dormant in the liver for a period of time after infection. When they become active again, the person gets sick again, known as a “recurrence”. Over time, the patient becomes anemic as blood cells are lost to the infection. With time, periods between episodes become shorter and permanent organ damage may occur. 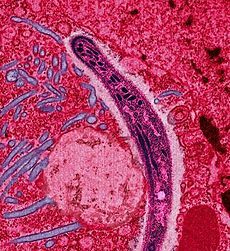 Diagnosis of malaria cannot be confirmed without a microscope, but anyone experiencing relapsing fevers with severe chills and sweating should be considered candidates for treatment. The medications used for Malaria include Chloroquine, Quinine, and Quinidine; other, later-generation drugs, are also available. 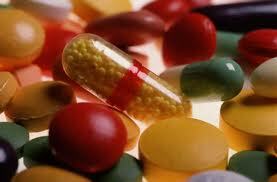 Sometimes, an antibiotic such as Doxycycline or Clindamycin is used in combination with the above. Physicians are usually sympathetic towards prescribing these medications to those who are contemplating trips to places where mosquitos are rampant, such as tropical climates. These drugs are also available as veterinary equivalents in avian or aquatic form. Looking for areas of standing water that could serve as mosquito breeding grounds. Drain all water that you do not depend on for survival. Monitoring the screens on your retreat windows and doors and repairing any holes or defects. Being careful to avoid outside activities at dusk or dawn. This is the time that most mosquitos are most active. Wear long pants and shirts whenever you venture outside. Have a good stockpile of insect repellants. If you are going to use sunscreen, apply it first and then apply the insect repellant. Some insect repellants are meant to be applied to clothing only, such as Permethrin. DEET, however, is acceptable for exposed skin; those areas not covered with clothing. DEET is acceptable for pregnant and breastfeeding women when used correctly (and, preferably, at 35% or less concentrations). Many are reluctant to use chemical repellants, and there are EPA-accepted natural remedies. Plants that contain Citronella may be rubbed on your skin to discourage bites. Lemon balm has been recommended in the past, but, despite having a fragrance similar to citronella, does not have the same bug-repelling properties. A large amount of damage can occur to humans as a result of small insects. Knowing how to recognize major insect-borne diseases, along with a program of systematic control of bug populations can decrease the number of people that have to deal with signficiant illnesses. Lear more about malaria and many other infectious diseases in austere settings by checking out the award-winning Third Edition of the Survival Medicine Handbook: The Essential Guide for When Medical Help is Not on the Way. Also, consider becoming more medically prepared with supplies and kits from Nurse Amy’s entire line at store.doomandbloom.net.